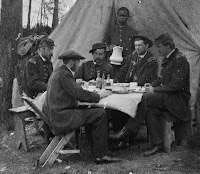 Army officers supplied their own furniture for their tents -including tables for dining, chairs, beds, dressers, desks, bookcases and occasionally a sofa. 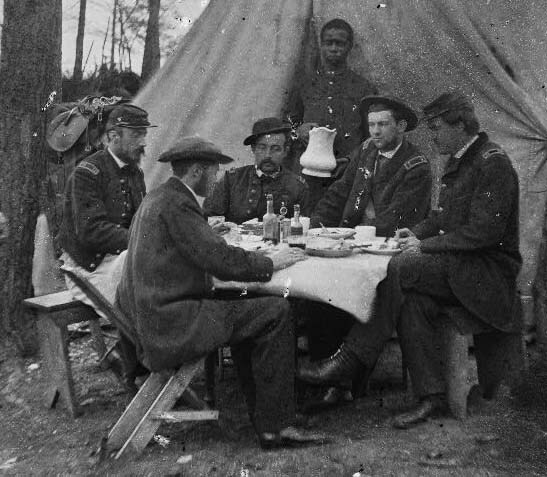 The "campaign furniture" or "camp tables" varied in design and in quality. There were some marvelous ways to dismantle ("knock down") or fold the tables to make them compact enough to easily transport. Their portability and in many cases double use, made campaign furniture popular aboard ships, in smaller English homes (such as beds from sofas or chairs), for explorers and travelers. The table with a long tablecloth in the British officer's tent (1780) probably had removable legs which were packed within the table tops or in boxes. Furniture makers created a variety of furniture to replicate the comforts of home for the officers. 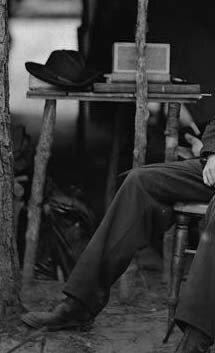 In addition to tables, the men could purchase numerous styles of chairs - even sofas - some folding out to make a bed; also desks, bookcases, and chests of drawers. Sheraton described two types of camp tables. The first table “… consists of two flaps …hinged at the under side. 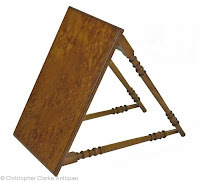 The triangular legs which support it, are fixed in the centre, by means of an iron triangle, with three screw pins and nuts…so that when the legs of the table are put to their place… and pressing the centre, the legs are contracted inwards, consequently the flaps are kept up, and secured to the legs at the same time. These tables are both simple, and will bear any degree of hardship. A couple sketches from Loudon seem similar to Sheraton's descriptions of the two tables. 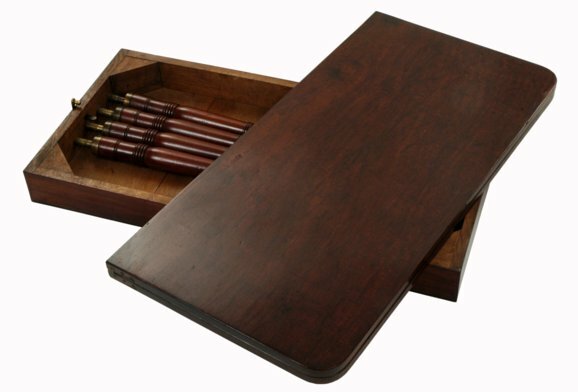 The British General Corwallis' table is now at the Yorktown Colonial National Historical Park. The top is removed, then the legs folded upon themselves. 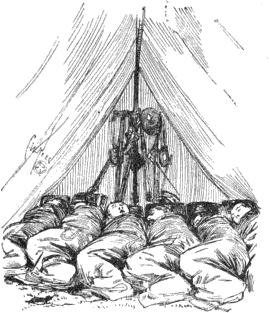 A British mess tent, 1778, with plainer tables and benches for the troops. 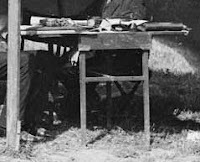 It may be like Sheraton's "trussel table" described above, or a trestle/sawbuck table as show in the Civil War and 15th cen. tables in the last section of this post. 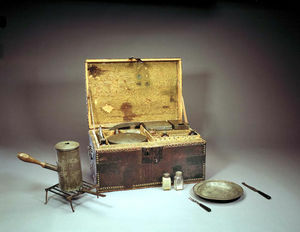 George Washington ordered two camp chests for dining on May 3, 1776. The one below is at the Smithsonian. 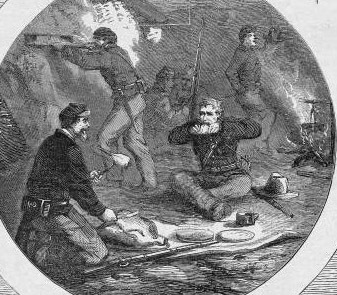 The sketch shows taking down the tents and loading the wagons during the Civil War. The officers are dining on a tablecloth covered table while sitting on benches and collapsible chairs. 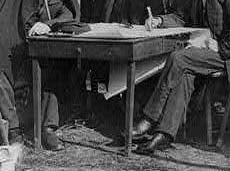 The legs of the table may have been removable and placed in the table top. This table is an X style with a peg in the center and and one at the top of the legs. The top pegs were taken out, the table top removed and the X legs folded into themselves. A similar style, though much fancier, is the campaign table of Cornwallis. 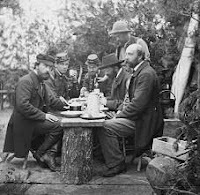 An interesting side-note on the table with the tree trunk base concerns three French princes - the son and grandsons of King Louis-Phillipe - who spent a year with General McClellan, and were photographed seated at Yorktown, May 1862. 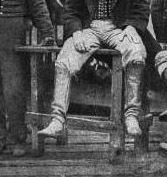 Francois d' Orleans, Prince of Joinville (b1818) a younger son of Louis-Philippe, and his two nephews: Prince Philippe d'Orléans, Comte de Paris (b1838, claimant to the throne) and his brother Prince Robert, Duc de Chartres (b1840) were honorary Captains. 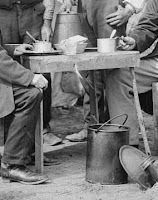 The other photo shows some of the Prince of Joinville's servants. 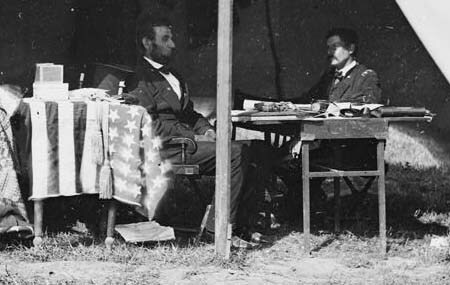 A long table at a headquarters had a tablecloth and a water pitcher with glasses on the right. It appears that saw-horses/sawbucks or trestles were used to support the table top or board in this sketch. 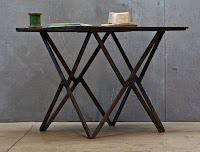 The next photographs show an even longer table top, laid on trestles, from 15th cen. Bruges, Brussels. The Civil War images are from the Library of Congress online collection HERE. The first print, “British Soldiers Drowning Care," 1794 is from the British Museum collection. The tent containing the table with the long tablecloth is a small part of A Visit to the Camp, 1780. "The Camp at Warley Common," 1778 by Paul and Thomas Sandby contains the mess tent with long tables and benches. The second print of the soldier sitting in his tent is Paul Sandby's "Encampment at St. James' Park, London, 1780." The horse image is from the Heal's catalogue 1853-6; the Oxenham trade card c1803 from British Museum's Banks Trade Card Collection, both found in: Brawer, Nicholas A. British Campaign Furniture: Elegance under Canvas, 1740-1914. NY: Harry N. Abrams, 2001. This book has wonderful pictures, particularly of the furniture used by British officers in India and South Africa in the 19th century.